Resource center Utilizing Aftercare as Part of Recovery How Do 12-Step Programs Work and What Are the Benefits? In recent years, there has been some controversy surrounding the effectiveness of 12-Step programs and their ability to help people who are struggling with addiction. There are those who say that the 12-Step model doesn’t really work and that people should rely on other types of treatment. However, other studies demonstrate various ways in which 12-Step programs help people recover from addiction and provide continuity during aftercare and once a person has returned to daily life after treatment. The 12-Step model has a number of benefits that are not to be dismissed lightly. Overall, research continues to demonstrate that these programs are helpful as part of a more comprehensive, well-rounded treatment program consisting of detox, various therapy types, and aftercare, and comprising a range of therapies and treatments that are customized to a person’s specific needs. The basic idea of the 12-Step program is to give people struggling with addiction a process through which to understand and manage their substance use disorders, as well as to find social support for recovery through others who are dealing with the same struggles. Make amends for those wrongs, as long as it is not harmful to the recipient to do so. Make self-analysis, removal of faults, and amends regular practices. According to a study from the Journal of Substance Abuse Treatment, cognitive restructuring – or the ability to change thought patterns in ways that also change behavior – is an important element of substance abuse treatment. The study shows that 12-Step programs can enable cognitive restructuring around substance abuse and similar behaviors. This type of work makes it possible for people to change their behavioral patterns concerning their substance abuse. Another purpose of 12-Step groups is to help the families and loved ones of people who are struggling with substance abuse. 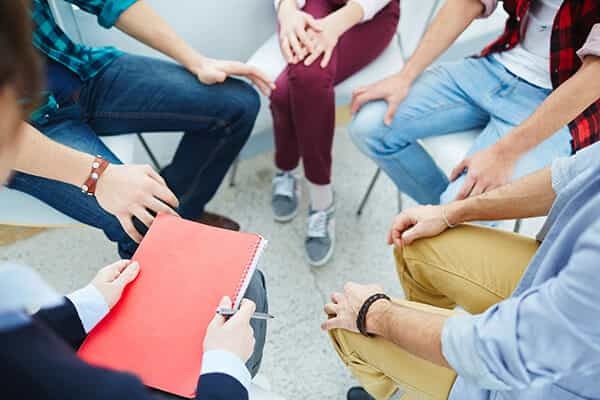 These include groups like Al-Anon for families and friends of people who abuse alcohol, Adult Children of Alcoholics (ACA), and Nar-Anon for families and friends of people who abuse narcotics. Along with these major, well-known groups, there are other organizations that have adopted the 12-Step methodology. Some groups that are based on different spiritual or religious beliefs have built their own programs based around the 12 Steps or variations on them in a way that incorporates those belief systems. In fact, some programs have built models around nonspiritual versions of the program. Many treatment centers incorporate these programs as part of their comprehensive treatment services. A member of the group, who is either selected beforehand or who volunteers before the meeting, leads the meeting. The meeting opens with a prayer or meditation, and with people introducing themselves and acknowledging their substance abuse problems, if desired. Members may present or be asked to present readings from the group’s specific literature, the 12 Steps, or other elements of the program. A specific substance abuse topic around the group’s interest may be introduced, or there may be a speaker or book presented, to provide education and/or generate discussion by the group. Members are encouraged to speak up if they have something to share with the group about their experiences or challenges. Another meditation or prayer is shared before the meeting closes. This general meeting structure can vary somewhat, or even widely, depending on the group. Because each group is self-sustaining, sessions may be altered to meet the needs of the specific group members. This variation may contribute to some inconsistency in the content; however, the guidelines and group literature support this. Who Benefits from 12-Step Programs? According to some sources, a key concept in the 12-Step model is: “It works if you work it.” This is shown by research, including a study in the journal Substance Use and Misuse, to be a factor in whether or not the program can provide positive outcomes. According to this study, people who are motivated to recover and maintain sobriety are more likely to benefit from the model than those who are not motivated. On the other hand, some research has shown that people who are mandated to join 12-Step groups, such as those who are required by the justice system to attend, are more likely to have positive results than those who are not mandated to attend. Less religious individuals seem to benefit as much as more religious individuals. Women and older adults are more likely to be engaged and benefit from these groups. People who maintain regular attendance are more likely to achieve long-term recovery. Participation in these groups can educate people on the benefits of a full treatment program. In other words, those who benefit from 12-Step programs are those who are committed to making the program work, who engage in other treatment as well as being engaged in the 12-Step program, and those who stay involved with the 12-Step group on a long-term basis. In particular, incorporating a 12-Step program as part of the individual’s aftercare program can help reinforce the lessons learned in rehab long after formal treatment is over. Even with the benefits of 12-Step programs, there are some people who may not be interested in the 12-Step model or who may not be ideal for 12-Step recovery. These individuals could still benefit from some type of peer-based treatment. As mentioned above, there are also self-help or peer support programs that don’t follow the 12-Step model. These include programs based on nonreligious ideas and programs that are modeled on religious, spiritual, or cultural practices that are different from the spiritual basis used by AA. These are typified by secular groups based on scientific understandings of mental health disorders as well as organizations established by cultural groups to connect participants to their cultures of origin. Because these models all have more positive outcomes when performed in concert with traditional addiction treatment, a preliminary step to obtaining the benefits of 12-Step participation is to contact a reputable, research-based treatment facility and get a personal treatment plan prepared.